This month, Mount Toby Concerts will present The Whispering Tree, a young and exceptionally talented Franco-American duo. Singer/songwriter Eleanor Kleiner and multi-instrumentalist Elie Brangbour craft richly immersive folk-rock brimming with evocative lyrics, nature imagery, perspectives from travel, and a panoramic musicality that encompasses traditional folk, indie rock, classic rock, and 1960s pop and rock n’ roll. 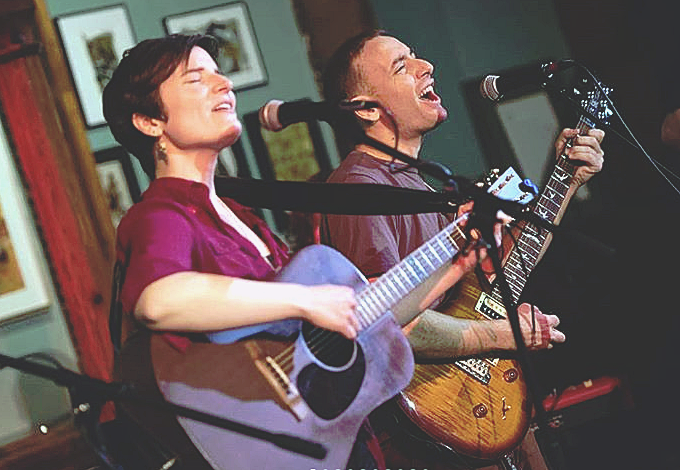 The twosome has garnered favorable comparisons to Cowboy Junkies, Over the Rhine and Aimee Mann. The pair’s debut, Go Call the Captain, was named “one of the year’s most luminous albums” by The Big Takeover Magazine, and NYC’s The Deli magazine called The Whispering Tree “one of the most talented duos to take stage in NYC.” Other marquee career moments include official showcases at the Northeast and Southwest Regional Folk Alliance Conferences; being Kerrville New Folk finalists and Philadelphia Songwriter’s Project winners and Eleanor and Elie having the honor to lend their voices to Pete Seeger and Lorre Wyatt’s album, A More Perfect Union. Their latest album, Invisible Forces explores duality and the struggle for a sense of permanence in the face of inevitable change, inspired by the pair’s new home in the pastoral Hudson Valley. “I found myself taking photos of abandoned places, there’s a peaceful beauty in watching these great man made structures fall back to the earth,” Eleanor shares. Elie adds: “There is beauty in nature reclaiming this ground.” The idea of the transience of the house appears on the impressionistic “These Houses” and the blues-riff driven “This House Is Split in Half.” The latter tune represents fresh turf for The Whispering Tree as the duo integrates a touch of classic rock swagger within its elegant folk-pop. Interesting enough, this bedrock music of the 1960s and 1970s has always been an influence, and prior to the album, The Whispering Tree released several singles re-imagining classic rock tunes as plaintive, harmony driven folk songs.